Window shutters Shrewsbury from your local shutter experts! Combining style, elegance and versatility, from the company that brings you quality, service and value. Not forgetting our shutters come complete with a lifetime guarantee. Call us today on 01743 290 688 for the very finest Plantation shutters in Shrewsbury and the surrounding areas. Window shutters are a versatile window dressing (that can also be used as room dividers, wardrobe fronts and on doors) that completely transform your home. Bringing in beautiful natural light, filtering it softly through semi-reflective louvres to maximise the ambience of a room without the glare. Giving you privacy while being able to enjoy the view beyond. Without the need for old fashioned nets or blinds! 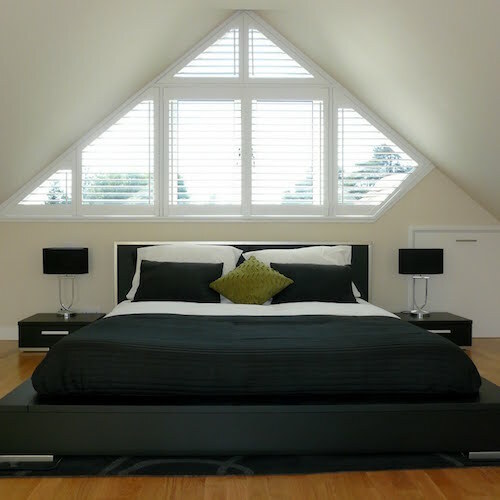 Just Shutters offer the widest variety of shutter materials and finishes in Shrewsbury and throughout the UK. Giving us the range and expertise to design the perfect bespoke shutters for your home. From stand out wow statements, to seamless design tie-ins. From bold colours, to colour matching, we can create the drama or subtlety you desire. With over 15,000 sets of shutters designed and installed we really have the rounded knowledge and skills to be able to create your ideal solutions. Whether your window or door is a perfect square, an arch, a bay, or a 50ft atrium (yes we have even created shutters for a 50ft atrium). Shutters are all designed and made to measure so they can fit beautifully those spaces curtains and blinds simply cannot. Making the most of every single window. Plantation shutters are not a sideline for us, they are not part of what we do, they ARE what we do, they are our passion and our specialty and as such we are able to offer the range, quality and value that puts us top of our sector. Lifetime guarantee – we are so confident in our shutters we offer an unbeatable lifetime guarantee, so as long as you have the shutters, we will support you with them. We would be delighted to show you what we can do for your home, please call us on 01743 290 688. Supply and fit three shutters and bay window. You may also like to see shutters Sutton Coldfield.